BSNL has announced special Unlimited Combo Broadband plans exclusive for Kerala Telecom Circle customers as promotional basis for a period of 90 days. State run Telecom Company Bharat Sanchar Nigam Limited (BSNL) has launched attractive Unlimited Combo Broadband plans across Kerala Circle to experience high-speed internet service at affordable monthly rates. New Combo Unlimited Broadband plans starts from Rs.545 to Rs.999 exclusively launched for Kerala Telecom Circle customers as Promotional offer basis. 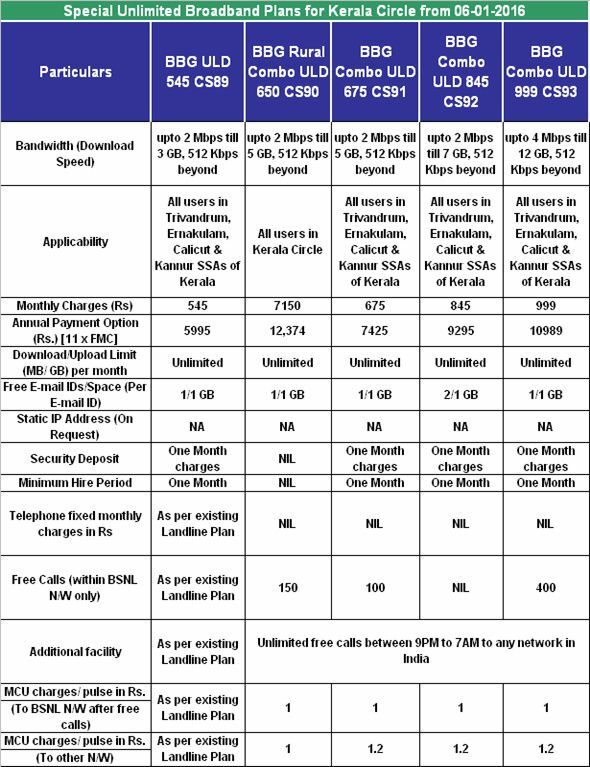 BSNL is offering Free Unlimited Calling facility to both urban and rural customers in Kerala Circle under these new plans, BBG ULD 54 CS89, BBG Rural Combo ULD 650 CS90, BBG Combo ULD 675 CS91, BBG Combo ULD 845 CS92 and BBG Combo ULD 999 CS93, available for a period of 90 days. Special Combo Broadband plans, BBG ULD 545 CS89, BBG Combo ULD 675 Cs91, BBG Combo ULD 845 CS92 and BBG Combo ULD 999 CS93 are available to Trivendrum, Ernakulam, Calicut and Kannur district of Kerala Telecom Circle. The above Broadband plans will be implemented with effect from 06th January, 2016 as promotional basis and available upto 05th April, 2016.